Every year over a million Cub Scouts participate in a Pinewood Derbies around the world, a tradition that goes back generations. Cub Scouts and their adult "assistants" work together to design, carve, paint, weigh, refine, and race their cars, a bond of partnership is created. 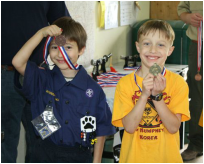 For Cub Scouts the Pinewood Derby build confidence and take pride in their own growing skills and hard work. So enjoy the ride! Webelos & Bears receive Pinewood Derby car kits through their Den Leaders. Kits include wheels, axles, and a wooden block—everything you need to get started. Think about your dream car, what you'll name it, and how you’ll build and decorate it. Learn about Derby requirements and check out some tested Design Tips on our site. ​Click to download the below important information. All Pinewood Derby cars NEED TO FOLLOW these rules. Otherwise, the cars may be disqualified.